The number of Chinese students pursuing higher education in overseas universities increased to 339,700 in 2011 and accounted for 14 percent of all the international students studying overseas, says a recent report. The report prepared by the Center for China and Globalization and published by the Social Sciences Academic Press on Sept 17, gave China the top ranking in terms of overseas students. It is also part of the efforts by the government to provide statistical information on Chinese students studying abroad. "A lot of people want to know the actual number of Chinese students studying abroad, but till now there has been no formal mechanism to collate the actual data into a report," says Wang Huiyao, director of CCG and editor-in-chief of the report. Wang says that with China having become the second-largest economy in the world, more Chinese families can now afford to educate their children abroad. Due to the international financial crisis many countries have loosened their visa policies and earmarked education as an important revenue earner, he says. 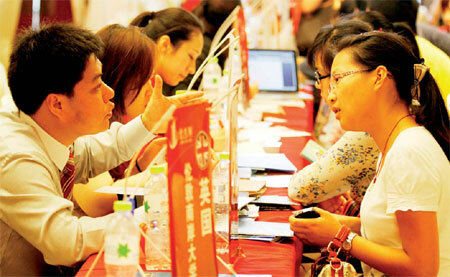 "The desire to pursue an overseas education has also been propelled by China's WTO membership. Many parents believe that an overseas education would increase the competitive advantage of their children and also provides an alternative to the rigid Chinese educational system." According to the report, demand for overseas education will continue for the next five to 10 years, with the average age of the students pursuing overseas education dipping further. The report says that many high school students are giving up on the gaokao (Chinese national college entrance examination) and opting to study abroad. Last year, some 76,800 high-school students went abroad for studies, accounting for 23 percent of all the Chinese students studying abroad, the report says. In 2009, 10.2 million students took the gaokao, while in 2010 it fell to 9.57 million. Last year, the number fell to 9.33 million, according to information provided by the Ministry of Education. Jiayu Li, founder of USAdaxue.com, a consultancy for Chinese students in the US and a former overseas student, says disillusionment with the Chinese education system is growing as it focuses more on teaching rather than developing independent thinking capabilities of students. "Most universities in China ask students to learn by rote, whereas universities in the US urge students to work on more projects to develop their creativity," Li says. Zhang Chen, a graduate from Columbia University and founder of AIC Education in Beijing, a consultancy on overseas education, says the practice of top Chinese students pursuing overseas education is unavoidable. "Most of the Chinese students are not satisfied with the fact that there is a gap between Chinese universities and US universities. The US universities are also far ahead of the Chinese universities in their capability to attract top-notch talent," Zhang says. He says that due to globalization, it has become much easier for people to travel around the world. "A decade ago you could not imagine how you could fly from New York to Beijing, but now it is a normal thing," Zhang says. The report also says that most of the Chinese students studying overseas, particularly in the US, are pursuing postgraduate studies. Last year, Chinese postgraduate students accounted for 49 percent of the international students in the US, a 16-percent increase compared with 2010. Finance continued to be the top major pursued by Chinese students, with more than 6.3 percent opting for courses in the subject. Other majors such as information management and environmental science accounted for 3.3 percent and 1.8 percent of the total. "Finance is still in the limelight as many students feel that if they obtain a degree in the subject, they can easily get a job in China," Li says. "But it is a pity that Chinese people do not choose to study majors like humanities, which are essentially the essence of Western thought." Though more students are expected to study abroad in the next few years, Wang says parents must exercise caution and be sure that their children can adapt to a foreign environment. "It is a good thing that these children can experience a different culture and environment, but they need to know first whether they can adjust to the new environment," Wang says. "This is especially so for many, as they are the only children in their family." More wage-earner families are now sending their children abroad for education, the report says. Before 2009, wage-earner families accounted for just 2 percent of the total overseas student population. However, by 2010, the number of such families had risen to 34 percent. "Most of these parents are the post-60s generation in China and those who want better education for their children," Li says. Wang Boqing, founder of Mycos, a Beijing-based education data consultation and assessment company, says that due to the renminbi appreciation and the higher per capita income of urban families, more Chinese wage-earner families can now send their children to study abroad. "Studying abroad will soon become a normal thing in China," Wang says. "It will be just like the people who left their cities to pursue education in Beijing or Shanghai during the 1990s."